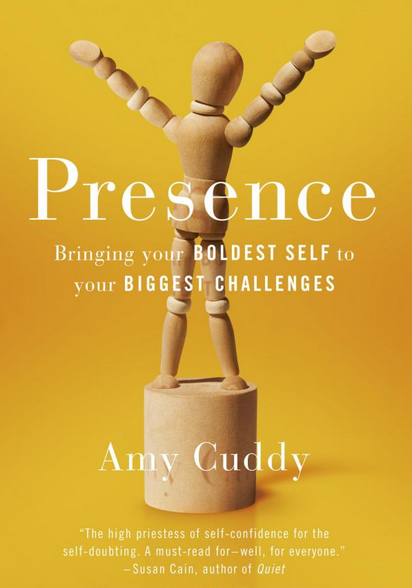 When someone releases a book called Presence I usually sit up and take notice. When that person an authority on confidence has given one of the most popular TED talks of all time (33 Million views and counting), it’s a fair bet I’m going to want to read it. I’m often disappointed by books in this arena, but Amy Cuddy’s Presence was a pleasant surprise. I had been concerned that she was going to try to find a way of turning her 20 minute TED talk into a complete book without adding any new material of value. My concerns were completely unfounded. If you are interested in the area of speaker confidence, this book is well worth the investment of your time and money. For those who haven’t seen Amy Cuddy’s 2012 TED talk she offered compelling research that there is a powerful link between how we hold our bodies and our level of confidence. Her research showed that simply standing like Superman or Wonder Woman with your hands on your hips and shoulders back for as little as 2 minutes raises testosterone (a hormone associated with confidence as well as maleness) by upto 25% and decreases the stress hormone cortisol by a similar value. So, in short it makes you feel more confident and less stressed. Furthermore, that people who adopted these poses as preparation for mock interviews or public speaking tests were rated significantly higher by those observing them than those who did nothing or adopted the opposite “low confidence poses”. The take-away messages are that if you’re doing public speaking or going into any challenging situation where you want to relate with others you will (a) feel more confident, (b) be perceived as more confident if you prepare by consciously adopting a confident body posture for a couple of minutes before you “go into battle”. (Preferably somewhere private, because you can look pretty silly standing like Superman/Wonder Woman in the auditorium before you go on stage). Not surprisingly the book fleshes out this research, gives a lot more data and also explains Amy’s personal story as to how she came to carry out this research. Touchingly she started from a position of having had a tragic accident that left her with very low self confidence and a strong case of “Imposter Syndrome” – believing that she didn’t deserve to be in her job as a lecturer and then professor in Business Administration at the Harvard Business School. This personal story made reading the book much more relateable and engaging for me. What does the book add for Leaders or Public Speakers? So, what does the book add to this clear and helpful message from her TED talk? Firstly, there’s a useful discussion of what Presence is and what she means by “Presence”. She offers lots of definitions of Presence, but her working definition is that it is “the state of being attuned to and able to express our true thoughts, feelings values and potential”. In other words, being able to bring your A-game to any situation. Though it’s fair to say that although it doesn’t form part of her definition she also nods to presence implying a quality of being in the moment and relational saying in Chapter 1 “When you are not present, people can tell. When you are, people respond”. So it seems that in her definition Presence also has something to do with the ability to be present and for others to feel that you are present with them in a way that is relational. Incidentally, for me Presence isn’t just a state, it’s an aspect of our being that we can tune into and enhance our connection with, among many other things. But I’d agree that all of the characteristics that she mentions come out of enhancing our connection with Presence. And she dedicates her book to looking at what supports this. There are two important aspects of confidence that in my view she doesn’t really cover in the book. The first is the way that choosing to be relational itself supports confidence. The second is how taking care of ourselves emotionally – self compassion for the parts of us that are having to endure difficult feelings can make us feel more confident. I’m guessing that is this because she hasn’t yet had experience of working with these modalities. I’ve written about these quite a bit in previous blog pieces. What she is strong on in this book is understanding the effect of confidence on leadership, actual performance and perceived performance and how body language and embodiment impacts on these. Chapter 2 deals with the importance of believing and owning your own story – and how being authentic makes us feel more confident. There are some great stories and studies on the effects of authenticity, and how being present encourages others into the zone. There’s also a nice discussion of how much we should prepare for speaking in public. Chapter 3 is entitled Stop Preaching, Start Listening and tells some powerful stories about how listening without judgment can turn us into powerful leaders, citing the story of Reverend Jeffrey Brown. She shows evidence that show that trust is more important than respect, and that to be a well regarded leader it is first most important to be available, liked and trustworthy before we even care about whether anyone is competent. As she puts it “we prioritise warmth over competence” and offers the nice statistic that if you not well liked as a leader the chances of you being viewed as effective is about 1 in 2000! Chapter 4 is called I don’t Deserve to be Here and is a helpful discussion of “Imposter Syndrome” and how it functions. From Chapter 5 onwards she gets to the meat of the book. A great discussion of Power (again with some nicely researched stories and some very interesting scientific studies) before she starts getting into the body language/embodiment material in Chapters 6, 7 and 8 and 9. Chapter 10 is called Self-Nudging: How Tiny Tweaks Lead to Big Changes. It’s about how to create change in a powerful and incremental way and is an interesting read in its own right. The last chapter Fake it Until you Become It is mainly a collection of stories of people who have taken the power-posing approach from her 2012 TED talk and made it their own, with some touching and surprising results. My personal favourite is the person who has used it to transform the behaviour of race horses! Is there anything important missing? I’ve already averted to two areas that I was surprised that Amy Cuddy doesn’t cover in any real detail in this book, around being relational and the effects of self compassion and self care. Another surprising omission is the lack of reference to any of the pioneers of Embodiment who come out of the Aikido tradition – so no mentions for Richard Strozzi-Heckler, Wendy Palmer or Paul Linden, who all offer important contributions in this field. If you want some pointers in that direction take a look at the blog piece I wrote about Strozzi-Heckler and my take on his work. Finally, there isn’t really any detailed discussion of neuro-plasticity (the ability of the brain to rewire itself through repetition of new behaviours), although though this is included obliquely through the “fake it until you become it” mantra. If you’re a professional coaching leaders or public speakers then the short answer is yes! Cuddy is a personable and entertaining guide who offers plenty of stories from her own life, lots of anecdotes from other people’s and lots of great insight and science. And if you’re someone who is simply interested in how we can use our bodies to feel more confident, this book isn’t the whole story, but it’s a great place to start. As always, I’m really interested to hear your take on this, so do please comment in the box below. And of course if you want to see how these insights can be integrated into leadership, presentations or public speaking, come on one of our Foundation Courses. previous post: How much should I prepare?